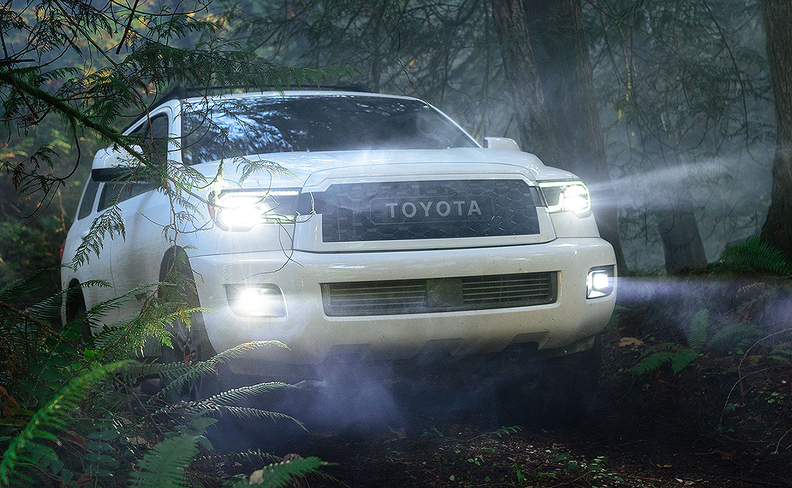 Toyota is expanding its off-road-ready TRD Pro lineup for the 2020 model year by adding a new trim level to the seven-passenger Sequoia SUV. The 2020 Toyota Sequoia TRD Pro, shown Thursday at the Chicago Auto Show, features a beefed-up chassis, specially tuned shocks and an array of off-road goodies designed to take the full-size SUV deep into the trails. Powered by a beefy 5.7-liter V-8 engine mated to a six-speed automatic, the Sequoia TRD Pro produces 381 hp and 401 pound-feet of torque, much of it at the low end of the tachometer, to aid in towing. It comes standard with Toyota's Multi-Mode four-wheel-drive system, which is optional on other Sequoia trim levels. The Sequoia TRD Pro is outfitted with specially tuned Fox shocks and equipped with a TRD front skid plate to protect the suspension and oil pan off-road. It comes standard with cast aluminum running boards and a TRD roof rack. Up front, the brand's name in capital letters is festooned across the large grille and flanked by LED headlights and fog lights. An optional cat-back exhaust system features a black chrome tip and debossed logo with a bold exhaust note that is electronically canceled inside the cabin. The big off-road SUV comes standard with push-button start and keyless entry, power driver's seat, moonroof and zoned climate controls. Toyota's Premium Audio also comes standard and features Android Auto, Apple CarPlay and Amazon Alexa compatibility. Like the Sequoia TRD Pro, other TRD Pro models will receive infotainment updates for the 2020 model year, Toyota says. The Tundra, Tacoma and 4Runner TRD Pros will be quipped with 8-inch touch-screen systems, while the Sequoia TRD Pro will feature a 7-inch touch screen.